Welcome to The Old House Web -- the Web's leading site for old-house enthusiasts. Create the best story collection ever assembled for old-house enthusiasts. We publish how-to stories, features, design ideas and first-person old-house adventures. Create the most detailed archive available of information about products for the old house -- plus the companies that supply those products. 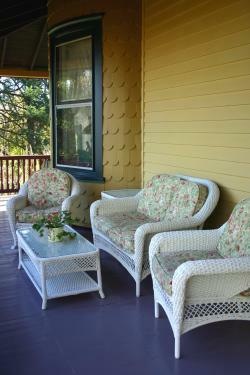 Create a fun and friendly community for old-house lovers -- a place where enthusiasts can swap questions and solutions. And create a lively marketplace where suppliers and manufacturers can connect quickly and efficiently with people seeking to buy old-house products. The Old House Web is a profitable company established in 1999. In 2006, The Old House Web transferred ownership and management. Following in the footsteps of its founders, we are also in the business for the long haul. We understand that in order to earn your repeat visits, our name must be synonymous with excellence. We love old houses, the Web, and publishing in general. Tina Broadhurst is editor-in-chief. Tina was born and raised in Wales in an 18th century Georgian mansion. Since then she and her husband have renovated homes in Britain, Russia, France, and America. Their latest project is a 1958 miner's cabin in northern Nevada. Lucinda (Lucy) O'Neill is managing editor of The Old House Web. An editor since 2000 and a do-it-herselfer since birth, Lucy enjoys a good challenge almost as much as a good Pinot. She and her husband live in a late 19th century Victorian in San Francisco's Liberty Hill Historic District. Bill Kibbel is The Home Inspector and review editor for The Old House Web. Bill is an inspector and consultant that specializes in historic buildings. He has inspected more than 10,000 buildings between 100 and 350 years old and has been a consultant to historic sites in several States. Bill is a veteran old-house owner and restorer and has been contributing to OHW since 2001. A growing network of old-house enthusiasts who write, take pictures and help make the site a resource for the entire old-house community. We've had a variety of nice things written about us. To see a sampling, follow this link. We'd love to hear from you -- whether it's a complaint, praise, a question or a suggestion. Here's how to contact us. If you make or sell products aimed at old-house owners and contractors, The Old House Web can help. Here's a page with more information about advertising with us.